The Speedrooter 92R with power cable feed makes the job of drain cleaning easier, faster and cleaner for your customers. Instead of wrestling with a manual snake in and out of the line, the power cable feed drives the cable into the line at up to 20 feet per minute. Put the feed in reverse and it retracts the cable easily too. Some cables weigh up to 100 lbs. so this is a real labor savor. The power cable feed and guide tube combination allows the cable to feed smoothly into the line while keeping your customer’s hands clean and away from the spinning cable. The Speedrooter is job tested tough. From its frame braced at key stress points, to General’s exclusive Flexicore® wire rope center cable that’s so tough it carries a one year warranty, the Speedrooter can really take a beating. Large drum holds 100 ft x 3/4” or 5/8” cable (30 m x 19 mm or 17 mm). Drum Removal: Loosen two knobs, remove ringbolt, and lift off. Foot Switch: Pneumatic, with no electrical contact between pedal and motor. Power Cable Feed: Drives and retracts at variable speed of up to 20 ft. per minute. Wheels: 10” semi-pneumatic heavy duty with ball bearings. Stair Climbers: Heavy-duty V-belts running on nylon rollers. Wheel Brake: Keeps machine in place on the job or in the truck. Truck Loading Wheel: Enables one person to lift machine onto bed of truck. Tool Box: Attached to rear of machine. Holds all cutters except Flexible leader. Leather Gloves: With double-reinforced palm for hand protection when guiding cable. Cables: Left wound Flexicore® wire rope center 3/4” diameter for 4” to 10” lines and 3” lines without sharp bends; 5/8” diameter for 3” to 6” lines; 9/16” diameter for 2” to 3” lines. Its field tested design offers easy handling. One person can easily load it onto a truck, as the machine slides smoothly from the loading wheel to the handle to the stair climbers and finally to the wheels. The handle is tall enough to make it easy to move to the job, yet quickly folds to take less room in the vehicle. A drum holds 100 feet of 3/4” or 5/8” Flexicore® cable and has a see-through inner cage, so you can quickly see how much cable is left in the drum. One person easily loads the Speedrooter 92 onto a truck. The swept-back handle and loading wheel give you the needed leverage. 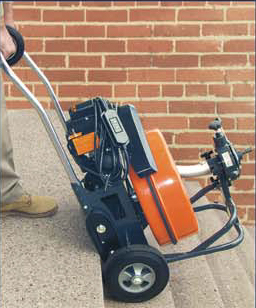 Equipped with 10″ heavy-duty wheels, stair climbers, tool box and ground fault circuit interpreter. V-belt stair climbers like the ones used to move heavy furniture and appliances let you take the Speedrooter 92R up a flight of stairs yourself. Greatly increases the efficiency of power cable feed by reducing cable whipping and drag. Keeps your hands off of the spinning cable. Tube is 30” long. Five foot extensions are made of rigid conduit with a flexible spring end. Heavy gauge wire is coiled around 49 strand wire rope and then heat treated. This cable has unequalled strength and the right amount of flexibility. It’s so tough, it has a one year warranty against defect or breakage.